As I mentioned before, this week is one of those lazy weeks with not much cooking involved. I’ve always loved sushi and had a craving. It’s not the healthiest thing to have, but it’s not like I eat it every day. 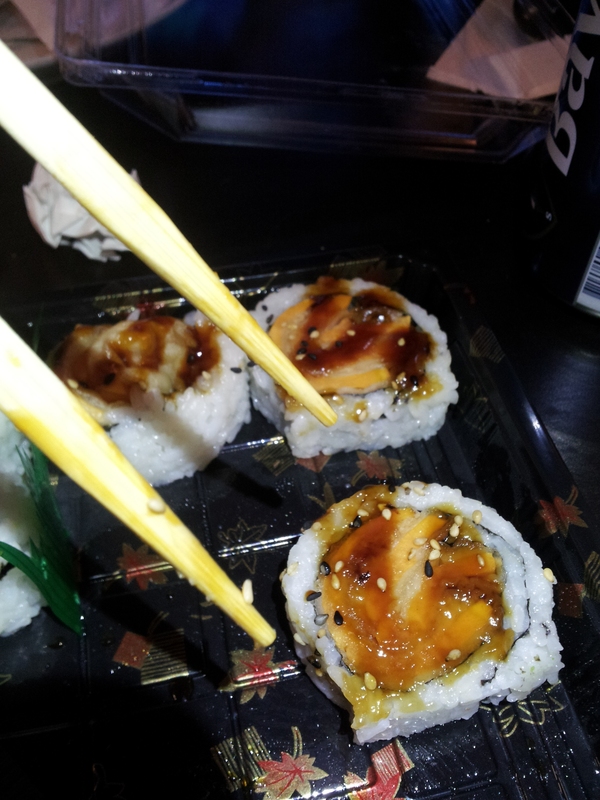 The roll in the photo had tempura yams in it, and a teriyaki sauce with sesame seed on top. I found the texture of this one to be like meat and it reminded me a bit of a salmon or tuna roll. I really enjoyed this one! I am going to start writing my meal plan soon for the week so I can come up with a grocery list and go grocery shopping. I love making new recipes and never really eat the same thing week to week (which definitely ensures I don’t get bored of vegan food); I came across a post from Peta’s website with a two week vegan meal plan. It looks pretty good! I might try a recipe or two. Any time I find a new recipe that looks good I save it on my computer as a document. Then when I want to decide what I’d like to add to a weekly meal plan, I just browse my own “electronic catalog” of recipes and pick what I want! It works out really well for me. Do you make meal plans?